The Houston Mopar Connection Club (H.M.C.C.) is proud to support the Houston area community. Over the previous decades our annual car shows have raised funds to help numerous Houston area charities. In July 2012 the H.M.C.C. was alerted to a desparate emergency appeal by aniMeals on Wheels. 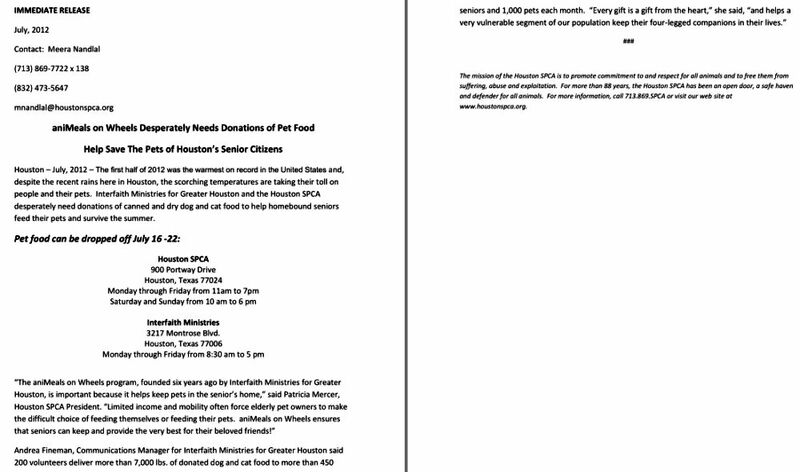 The aniMeals on Wheels program was founded so that home-bound seniors on Interfaith Ministries for Greater Houstons Meals on Wheels for Greater Houston program would not feel compelled to share their limited food and resources with their four-legged friends. IM collects donated pet food that volunteers deliver each month to seniors. Consequentially, on Friday July 20, 2012 the H.M.C.C. donated 250 pounds of dog food and 220 pounds of cat food in the name of the club to the aniMeals on Wheels program.